Length: approx 6.5 miles. Bring at least 1.5 liters of water, a snack and/or lunch. Please wear hiking boots and dress in layers. Please RSVP on the Meetup page for this event. At 200 feet tall, Buttermilk Falls are the highest in New Jersey. Well start this challenging hike at 10:00 am by climbing stairs, which run to the top of the falls. Well then continue up the steep Buttermilk Falls Trail for another 1,000 ft of elevation to reach the Appalachian Trail, Crater Lake and Hemlock Pond. We will return via the Woods Road Trail and again down to the falls on the Buttermilk Falls Trail. 7.5 miles will take approximately 5 hours to finish. Since, we will be using the steep, two mile, Buttermilk Falls Trail as our starting and return route for this hike, it is not recommended for beginners. Waterproof hiking boots or hiking shoes are required (No sneakers). Bring at least 2 liters of water, snacks and lunch. The pace will be relaxed with plenty of breaks as required. There are no restrooms at Buttermilk Falls, please plan accordingly. Heavy rain will cancel/postpone the hike. GPS Coordinates: 41.137085,-74.889207 Please RSVP on the Meetup page for this event. What a great time to visit this vista filled park! Easy to advanced hiking is available. The campground is near Alander Peak and Brace Mountain. After a vigorous hike you can jump into the cool water at majestic Bash Bish Falls! Bicycle the Harlem Valley Rail Trail; it is great for mountain bikes and hybrids, or map out a route on the quiet roads in this bucolic area. Hot showers and flush toilets available. To reserve a spot, send a check for $42.50 made out to Campers Group, to: Campers Group, 48 S. High Street Mt. Vernon, NY 10550. Once the organizer or a trip leader is notified of receipt of your check, you will be added to the RSVP list. For immediate inclusion, pay $44.00 via PayPal on the meetup.com page for this trip. Our friend Eugene is hosting this weekend at his bungalow in Sullivan County New York. The bungalow has WiFi, a fridge, gas stove and backyard grill, hot water, but no heat. Bring your own small electric heater (if needed) or warm sleeping bag, bedding and towels. There are 4 bedrooms and pullout couch in the living room. Each bedroom has a full bed (or pullout couch), 1 bedroom has a full and twin bed. There is one bathroom with a shower. Besides hiking near Bethel Woods and Sams Point Preserve, there is an Ashram, the Sivananda Yoga Ranch, close by which has a yoga class and a vegetarian meal for about $20 starting each day at 4pm (10 min drive). There is also camping and rooms available. To reserve a tent spot, send a check for $20 made out to Campers Group, to: Campers Group, 48 S. High Street Mt. Vernon, NY 10550. Once the organizer or a trip leader is notified of receipt o your check, you will be added to the RSVP list. For immediate inclusion, pay $20.89 via PayPal on the meetup.com page for this trip. This spacious, hip restaurant has nice selections, friendly staff, and a large garden dining area. Meet us at 12 pm, and we will enjoy a meal together before we discuss and decide on future trips. Afterward, perhaps we will stroll over to the nearby High Line Park, or another location. If you have joined us on one or more of our outings, we would greatly appreciate you helping us on a weekend or day event as a leader or co-leader. If it is your first time, dont worry, we will partner you with a more experienced member. We are a volunteer-run club that needs more of their members to participate as trip leaders. For immediate inclusion RSVP on meetup.com. Enjoy the comforts of a warm and cozy cabin by the rushing waters of Tohickon Creek, in Bucks County PA. On Saturday and Sunday, water will be released from an upstream dam, enlarging the creek and making it a nirvana for whitewater kayakers. We will just be watching, unless any of us is experienced enough and has whitewater gear to go on the river. For the rest of us, there will be a hiking trail (out and back, 2 miles each way, 200+ ft initial climb) that passes right by the cabins in Tohickon Valley Park, which leads to the scenic High Rocks vista, and then on to Ralph Stover State Park and the whitewater put-in. In the Doe Run Campground section of the park, this modern but small 2-room cabin has a kitchen with a full size refrigerator and stove, bathroom, shower, wood-burning fireplace, outside grill, and indoor heating system. The cabin also has one bedroom (with one set of bunk beds and one queen size bed) and a common room (with one queen size pull-out sofa bed), sleeping a maximum of six (6) people. You will be sharing sleeping quarters. The park also has campsites for the hardy (accessible from the second entrance on Cafferty Road, or about a 10-15 minute walk up to the ridge from the cabin) at Tohickon Valley Campground. If you would prefer more plush accommodations, there are a number of B&Bs local to this area, and Airbnb may also be a good option. Sorry, the park does not allow camping on the cabin grounds. Bring your own food, utensils and sleeping bag or bed linens. To reserve a spot, send a check for $54 made out to Campers Group, to: Campers Group, 48 S. High Street Mt. Vernon, NY 10550. Once the organizer or a trip leader is notified of receipt of your check, you will be added to the RSVP list. For immediate inclusion, pay $55.87 via PayPal on the meetup.com page for this trip. 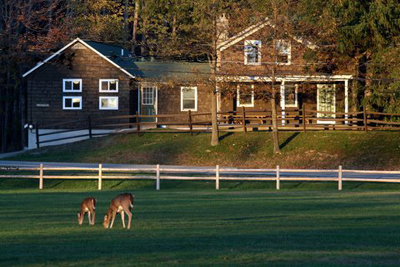 Our friends at Thendara Mountain Club have invited us to stay overnight at their rustic cabin in Harriman State Park. The cabin (built 1929) has heat, electricity, a full kitchen, indoor mens and womens washrooms with hot showers, and heated bathrooms about 50 ft from the lodge. There are seven bedrooms with 2-4 cots each (rooms are shared). The cabin has a big main room with fireplace, comfortable seating, eating table and screened in porch. The weekend includes Saturday night dinner, Sunday breakfast and a bag lunch. Arrive a little before 10am on Saturday to join us on a moderately strenuous hike. We may carpool to the trail head. After the hike we will return to camp for a relaxing and well deserved happy hour in front of the fire! Dinner will be provided by the Thendara host for this weekend. Breakfast and sandwiches will be available on Sunday. Diet restrictions can usually be accommodated - just be sure to tell the host when you RSVP. You need to bring a sleeping bag or sheet and pillowcase. There are wool blankets and pillows available. There will also be a local hike on Sunday starting at about 11am from camp. The total cost will be approximately $45, which will cover meals and lodging. You can also join us just for the Saturday hike for $7. To reserve a spot, send a check for $7 made out to Campers Group, to: Campers Group, 48 S. High Street Mt. Vernon, NY 10550. Once the organizer or a trip leader is notified of receipt of your check, you will be added to the RSVP list. For immediate inclusion, pay $7.50 via PayPal on the meetup.com page for this trip. We are staying in the cozy Wickapeck Lodge at Fairview Lake YMCA Camp. This is a family weekend - all kids welcome! The lodge has 5 bedrooms that sleep up to 6 each, 2 bathrooms with hot showers, living room with fireplace and a small kitchen. Organized activities may include hiking, rock wall climbing, high ropes (zipline), archery/rifle range, interpretive walks, arts and crafts and more. The activities and meals are included (they do not offer an option without meals). Meals in the dining hall will include a Friday night dinner, 3 meals on Saturday, and breakfast and lunch on Sunday. Special dietary needs can be accommodated if requested beforehand. Per person cost is $147 (by check or credit card), which must be mailed directly to the camp with their completed form, plus the $3.39 Campers Group fee, paid when you RSVP. If you do not send in your payment by Wednesday November 2nd, you will be taken off the attending list until the camp receives your payment. To reserve a spot, send a check for $3 made out to Campers Group, to: Campers Group, 48 S. High Street Mt. Vernon, NY 10550. Once the organizer or a trip leader is notified of receipt of your check, you will be added to the RSVP list. For immediate inclusion, pay $3.39 via PayPal on the meetup.com page for this trip.